It was a relationship that never should have worked in the first place. Clark was quite a bit older than she was, though that gap had closed considerably thanks to his immortality and Asha’s refusal to join him. It was a stance she had kept with keen determination. It was beginning to waiver, however. She was being pulled into the idea of it, falling victim to its thrall. She felt useless and helpless right now and with what Clark was planning, she knew she’d have to be stronger. Asha would do anything to keep her children from falling into the same hole she had. She was not as vulnerable and breakable as most thought. Only Clark seemed to realize that. He was the one who knew her best. It was a little eerie how well he could read her. Clark never directly pressured Asha to accept his offer. No, he was much better at subtlety. Asha had lost before she’d even had a chance to truly play the game. She was still so young yet and even with her background, she had a long way to go and many lessons to learn before she’d be able to stand toe-to-toe with someone like Clark. It wasn’t all cruel manipulation, however. He simply wanted her safe and that was ensured if she could protect herself. There was always a chance that someone would find a crack in his armor and expose it. He wanted to be prepared for all situations. Emma didn’t bother thinking about the erstwhile ways of her parents. It was so much easier to just forget they weren’t normal and accept everything as it came. Rhys’ father had grounded him and banned him from inviting Emma over after the whole ‘egging incident’. That didn’t keep them from talking, however. Rhys just wasn’t meant to ‘act out’, Emma reasoned. She wouldn’t give him anymore bad advice. She couldn’t risk losing her one and only friend. Her status and her parents had kept her from really being able to befriend anyone else. They were either in awe of her or terrified of her. It wasn’t an easy life. It was rather lonely, actually. At least she had Julian, even if he was her annoying little brother. The pranks they had pulled on the adults were quickly turned around on her as a bucket of cold water splashed down on her from on high. Julian’s cackle cut through the air as Emma’s anger built. She raged up at him, swearing vengeance. They both knew it was a hollow threat. Julian was an excellent prankster. Their relationship wasn’t purely antagonistic, however. They got along quite well and were fairly close in age. It wouldn’t be long before Julian was running through the same halls as Emma, causing chaos in his wake. Rhys had never really approved of Julian’s outlandish behavior, which only drove Julian harder. Emma was not looking forward to being stuck between the two of them. When they weren’t pranking each other, they were enjoying the waterfall near their house. The water was cool and clear. Best of all, it was away from the prying eyes of the paparazzi. Asha was having a hard time coming to the realization that her baby boy was going to be a young man soon. It just seemed too sudden. She kept thinking she’d walk into his bedroom and he’d be there, lying in his crib, looking angelic. Instead, he was usually hanging from his bed and cackling madly. One time, he’d even rigged the doorway to drop a bucket of ice on top of her. He was anything but angelic, more a little devil, but he was her little devil. She wasn’t ready for him to be a big one yet! Morrigan disapproved heartily of Clark’s attempts to bring Asha into the fold. She wasn’t a babysitter and she didn’t want to be stuck teaching some little tart how to throw a punch. The look on his face made Morrigan smirk. She’d hit a sore spot. She knew without question that he wanted to pummel her right there and then, but held himself back. He was nothing if not composed. It was his greatest attribute. Still, Morrigan had hoped for more a fight. “Just shut up and do your job, Morrigan. No one is asking for your opinion on the matter.” Clark said stiffly, walking away. Emma could hear them arguing as she did her homework. It was a usual thing. She dismissed it easily and instead tried to focus on the math problems in front of her until a voice caught her attention. Julian was calling to her from across the room. He’d just got back from some nerd thing he did after school. Why couldn’t he have just gone to a preparatory academy or something? Emma loved her brother, but his prattling on about nerd things and the supernatural drove her insane. He loved the fact that their parents were ‘weird’. He embraced everything about them. He was even pretty hyped about the fact that they were a crime family. Everything was easy for Julian. The same stigma didn’t follow Julian around. People weren’t afraid to talk to him simply because they weren’t given a chance–he walked right up and started a conversation. Emma had always been better at glowering in a corner than being a winning conversationalist. She wasn’t shy, she was just guarded. Julian put everything out there… or at least, so it seemed. He was as likely to smile at you as he was to turn around and stab you in the back. How could such a lout be so damned lovable? It drove Emma nuts. It just wasn’t fair. While her children were blossoming and growing, Asha was dying. She stared into the mirror, barely recognizing the face that stared back at her. Regret rolled through her, causing her stomach to churn. Had she made a mistake? It was too late to go back now. Asha had spent the past few months stepping out of the spotlight for the first time in her entire life. She’d waved goodbye to her career and all that it had afforded her, opting instead to become a recluse. The disappearance of Asha Steel would be a mysterious one, shrouded in intrigue. It would funnel her image further into a state of worship. It wasn’t what she had wanted, but it was necessary. No one would recognize her now, she barely even recognized herself. She was a ghost of her former self, quite literally. Her complexion had paled and her eyes had an unearthly glow about them that was haunting. It was more prominent than even Morrigan’s. There was no explanation for it past that the transformation affected everyone differently. Asha’s reflexes were amazing. She’d gained agility with the change, as well as an unshakable aura that slipped through any mental wall and made her irresistible. She could walk around in a potato sack and still be thought of as a goddess. Morrigan had said it was a reflection of her inherent skills. The way in which she had said it was derogatory at best. Asha walked uneasily into Clark’s lair for the first time. She’d known of its existence, but had opted to stay away. She’d always been separate from his business, blissfully unaware of the dangers that surrounded him and the deals that he struck. Now she would be a part of it. It was necessary. Ignorance would only lead to death. Clark moved to her quickly and she allowed him to embrace her. It was a comfort that her heightened senses buzzed with. She’d been in a coma-like state for nearly a day while the change had worked its way through her. It had been burning agony until she’d awoke. She’d nearly screamed when she saw herself in the mirror. It had taken days to adjust and accept. “You’re angry with me now, but you won’t be. Not once you see how right this is.” Clark insisted, tracing the line of her jaw with his finger. Asha walked through the backyard, allowing the rain to soak through her clothes. She felt aimless. Even after spending several hours with Clark, she was still worried. As much as her new abilities thrilled her, the lure of it all, the temptation to give in completely frightened her. Asha was so lost in thought that Morrigan surprised her completely when she approached. Asha was indignant and overcome with anger. She wanted to slap Morrigan silly, but even with her heightened abilities, she was no match for the much older vampire. Instead, she looked angry and balled her fists at her sides. She walked away and disappeared into the darkness, not giving Asha a chance to respond. Emma had a different take on the whole thing. She worried for her mother, for what this meant for their family. Emma had never minded her step-father’s eccentricity or even what he did for a living, but that was because he was suited towards it. Her mother, however… was different. It was hard to say what the future held. Asha and Dominic make beautiful babies… are we surprised? Not really. Julian is adorable, but he’s a total prat. He is constantly pranking and just being plain inappropriate to everyone. Of course, he does it all with a smile. Sigh. 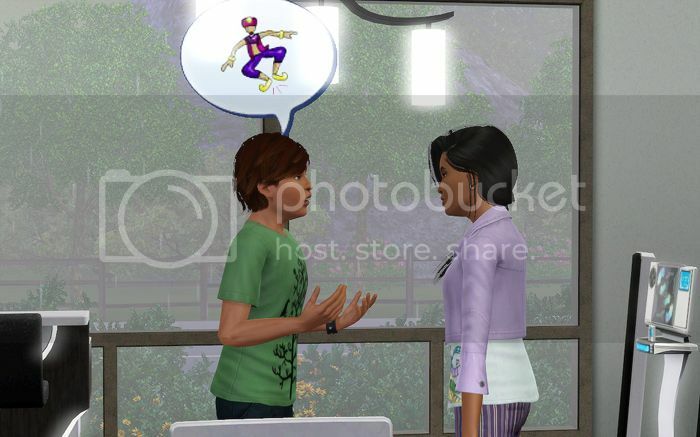 If this tells you anything, he’s the ONLY sim on the lot Morrigan can have a decent conversation with. Yeah. Emma isn’t exactly Miss. Congeniality, either. 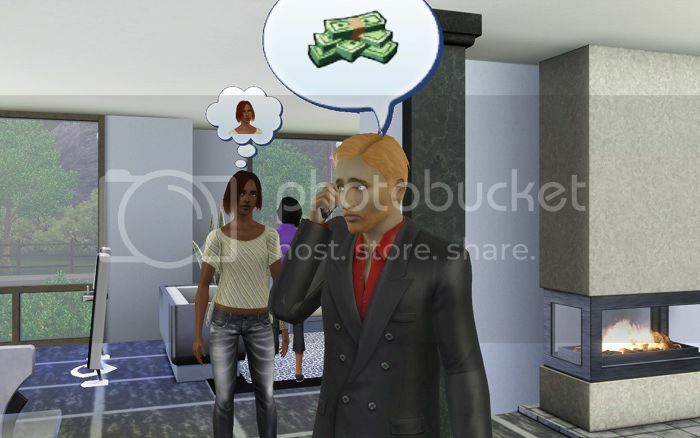 This generation has not produced many “nice” sims, LOL! Not a whole lot to say other than it mostly rained this entire update. Geeze. Title is Yellowcard – ‘Lights and Sounds’. LOL, I love, love, love Julian! He is going to be a ton of fun to watch. I have to say though, I’m definitely feeling the same as Emma on Asha becoming a vampire. I’m a bit worried that she’s got herself into deep, deep trouble and won’t be able to handle it. We’ll see though. Clark certainly seems confident but then, he always does! Julian is going to be so much fun, LOL! I am curious as to what the whole vampire thing will do to Asha’s personality, in the long run. There’s a lot of variables at play here. Should be interesting! I totally heart Julian! I was sad that he aged up to teen, he was such a cute little kid, and I felt like Asha in that he was aging up too fast. I’m glad that Emma and Julian have each other and a rather decent relationship, that will help them I think down the line. And I am so sad over Asha… her skin was so beautiful, and her eyes, and she’s definitely like a whole new person now. Even if she had a darker side, I really liked the humanity she did possess, and am concerned how that will change. Also… who wants to live forever if your children won’t? That seems depressing to me, and I can’t imagine that Asha would like that, she didn’t like Julian turning to a teenager. I feel for Emma in this household, she reminds me of Asha, or how I imagine Asha as a teen, but she has better parents that don’t use her and make her be in the business. I can’t believe Julian is a teen already. I had to double-check my aging sheet just to be sure! Emma and Julian do have a pretty good relationship for siblings. I know. I was so sad how drastically it changed her appearance, but you’re right, it’s like a whole different person. She’ll be changing, slowly. We’ll see how that goes. I can’t imagine she wants to outlive her children, but she’s a bit more focused on keeping them safe and ‘away from the life’ at the moment. Emma definitely acts like Asha might have when she was a teen. Emma is a bit more secure in herself, though. She’s a lot ‘harder’ than Asha. I can see her becoming an ‘ice queen’ easily.